President Rivlin tells French Foreign Minister that Israel mourns victims of Friday terror attack, including heroic policeman. 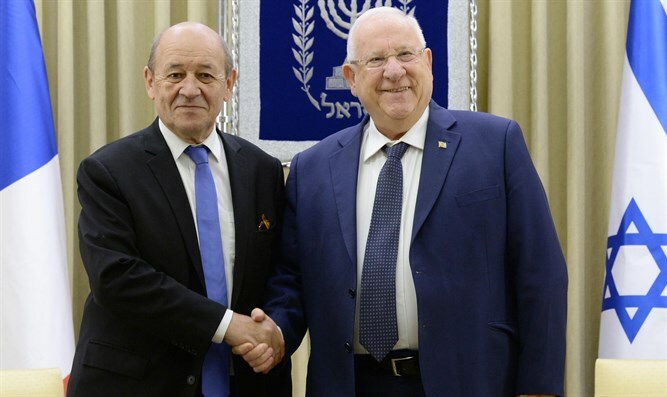 Israeli President Reuven Rivlin met Monday with French Foreign Minister Jean-Yves Le Drian. Rivlin expressed Israel's joint mourning with the French people for the victims of the terrorist attack that took place in France last Friday. "Every Israeli citizen held their breath when they witnessed the actions of the policeman who lost his life in this latest act of terrorism in France, when they saw the dedication and the way in which the French policeman acted to protect the inhabitants of France against crime and terror," Rivlin told the French Foreign Minister. "The dedication and commitment of the French policeman should be a model for all the defenders of freedom in the world. We know terrorism is terrorism whether it is in London, France, the United States, Jerusalem or Cairo," Rivlin added. The President stressed the importance of cooperation between the two countries. "Israel has existed in its modern form for 70 years, and France has been with us from the first days of the state's existence, and the cooperation between the countries is enhanced and includes many areas in our lives. We recognize the centrality of France in European and global activities and wish [for France] to pay attention to the needs of the State of Israel, which is often attacked in international forums for political reasons and not for practical reasons." Rivlin told his guest, "As President of the State of Israel, I welcome you with great respect in Jerusalem, the capital of Israel, as a fact that has existed for 3,000 years, and not even UNESCO can change such a historical fact." "We are in a difficult period in the entire world, and here in our region. The Iranians are at our doorstep, and the world will do well to see that Iran supports terror and therefore it must be made clear that its support for terrorism can not be accepted with indifference by the free world. The French foreign minister thanked the president for his warm welcome. "In the coming months, the Prime Minister of France and the President of the Republic of Cameroon will visit Israel, and of course there will be a visit in June in France, a visit that we look forward to. This should be a long and intense period of friendship that will be constantly growing stronger and I thank you for mentioning the policeman who sacrificed himself and your wish to express condolences. And I wish to express my condolences regarding the murder this past weekend in Paris of an 80-year-old Holocaust survivor in her home," he said, referencing the murder of 85-year-old Mirelle Kanol. "We still do not know the motive behind it, but I hope that we will soon know exactly the reasons for the shocking murder," he concluded.